I regret to post this sad news of talented guitarist Terry Wallace who passed away on August 14, 2008. A true pioneer of Birmingham's early rock 'n' roll scene, Terry was the founding member of Brum's legendary local group The Vikings who formed in the late 1950s. The Vikings were fronted by a number of charismatic singers including George "Duke" Mann, Keith Powell, and Carl Wayne. It was during Carl's association with the band as "Carl Wayne and The Vikings" that they enjoyed their greatest success with the line-up of Terry Wallace (guitar & vocal), Johnny Mann (guitar), Dave Hollis (drums) and Chris "Ace" Kefford (bass guitar & vocal). Terry Wallace while playing his famous Fender Stratocaster guitar was a familiar sight on stage with The Vikings as they packed the dance halls around Birmingham while performing rock 'n' roll classics along with many chart hits of the time. The American guitarist Eddie Cochran was a big influence for Terry in the early days. 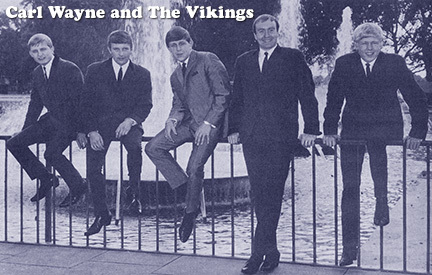 Carl Wayne and The Vikings became one of Birmingham's top performing bands during the first half of the 1960s along with Mike Sheridan and The Nightriders, Denny Laine and The Diplomats and The Spencer Davis Group. The Vikings - known for their smart appearance and polished stage performance - performed throughout the West Midlands as well as doing a number of engagements in Germany. They were signed to the Pye Records label in 1964 and had two singles released; 'What's A Matter Baby' and 'This Is Love'. Bev Bevan from The Diplomats replaced Dave Hollis on drums just before the group departed on their final trip to Germany. The Vikings split up at the end of 1965 but then re-formed as The Move with the addition of guitarists Roy Wood from The Nightriders and Trevor Burton from Danny King's Mayfair Set. Terry Wallace and Johnny Mann were not part of the new line-up but Terry soon joined "Mike Sheridan's Lot" before his interest turned to folk music and he switched to playing an acoustic guitar. Terry formed 'The Southeners', a successful trio with his wife Cheryl as lead vocalist and Robbie Harper on bass guitar. Years later, Terry recalled his days as a folk musician to be amongst the happiest of his long career in music. A former Metro-Cammel and Leyland employee, Terry Wallace lived in Erdington and was father of two. He never lost interest in playing guitar and was later in a number of other local groups including "Sounds Hawaiian" and "The Nightshift". He had fought a two year battle with cancer (Mesotheioma) before passing away at age 66. My deep sympathy goes out to Terry's family and his many friends. He will be missed.